Tucson, Arizona: October 17, 2017 – Agrichemical corporation Monsanto hasn’t been in Tucson headlines much since it dropped its bid for a tax incentive with the Pima County Board of Supervisors in February. 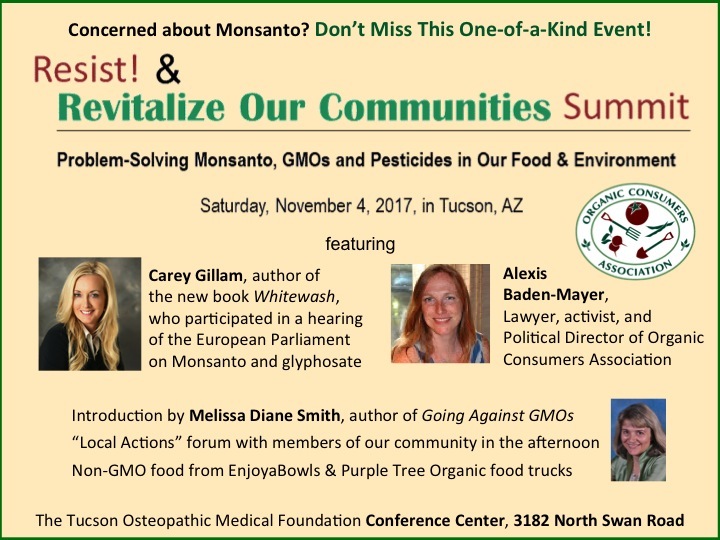 But the company and its flagship weed killer Roundup have been under fire both nationally and internationally this year and will be in the spotlight again at an educational summit at the Conference Center at the Tucson Osteopathic Medicine Foundation, 3182 North Swan Road, in Tucson from 9 am to 3:30 pm on Saturday, November 4. Organized by a group of concerned citizens known as Toxin-Free Pima County, the Resist! & Revitalize Our Communities Summit will reveal uncovered secrets about Monsanto’s tactics that propelled Roundup weed killer to be so widely used, along with actions that citizens can take to protect themselves against pesticides and genetically modified foods that Monsanto and other biotech corporations produce. The keynote speaker for the event is Carey Gillam, a veteran journalist whose recently published book Whitewash: The Story of a Weed Killer, Cancer and the Corruption of Science is a 20 year capstone in investigative reporting into details behind Monsanto’s Roundup rise to dominance. Gillam, the head researcher of US Right to Know, also spoke at the European Parliament in October at a hearing on Monsanto and glyphosate, the active ingredient in Roundup. Local author of Going Against GMOs, Melissa Diane Smith, will introduce the summit and Gillam in the morning. The afternoon session will feature Alexis Baden-Mayer, Political Director of the Organic Consumers Association, who will provide an overview on local actions taking place in communities across the country, followed by a forum with a panel of Tucsonans, including a pesticide-free landscaper, farmer, and organic agricultural products supplier. The summit takes place about a month after the European Union Parliament banned Monsanto lobbyists from attending any meetings there because the biotech giant did not show up for hearings into allegations that it had interfered with safety studies, Watters says. Also this year class action lawsuits were filed by farmers who claim their crops were damaged by Monsanto’s Dicamba herbicide, and by people who have non-Hodgkin’s lymphoma, which they allege is from exposure to Monsanto’s Roundup herbicide.